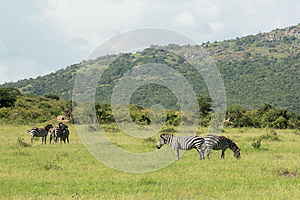 This photo is taken in Maasai Mara National Reserve, Kenya. The Maasai Mara National Reserve also known as Maasai Mara and by the locals as The Mara is a large game reserve in Narok County, Kenya; contiguous with the Serengeti National Park in Mara Region, Tanzania. It is named in honor of the Maasai people the ancestral inhabitants of the area and their description of the area when looked at from afar: `Mara,` which is Maa Maasai language for `spotted,` an apt description for the circles of trees, scrub, savanna, and cloud shadows that mark the area.nnIt is globally famous for its exceptional population of Masai lions, African leopards and Tanzanian cheetahs, and the annual migration of zebra, Thomson`s gazelle, and wildebeest to and from the Serengeti every year from July to October, known as the Great Migration.nnThe Maasai Mara National Reserve is only a fraction of the Greater Mara Ecosystem, which includes the following Group Ranches: Koiyaki, Lemek, Ol Chorro Oirowua, Olkinyei, Siana, Maji Moto, Naikara, Ol Derkesi, Kerinkani, Oloirien, and Kimintet.